PS: I will have another pink weekend outfit coming up next too. Today looks will be more to casual shorts date look. I can't tell you guys how much I like set outfit! I always love set outfit in culottes or in shorts set. I mean when you can get two separate outfits at one price. You can easily mix and match with any top or bottom after you match with their original set outfit. I bought 2 Pink Outfit set for the month of October! But this outfit color coordinate is pretty neutral and harmony, Pink + Khaki looks really nice together! 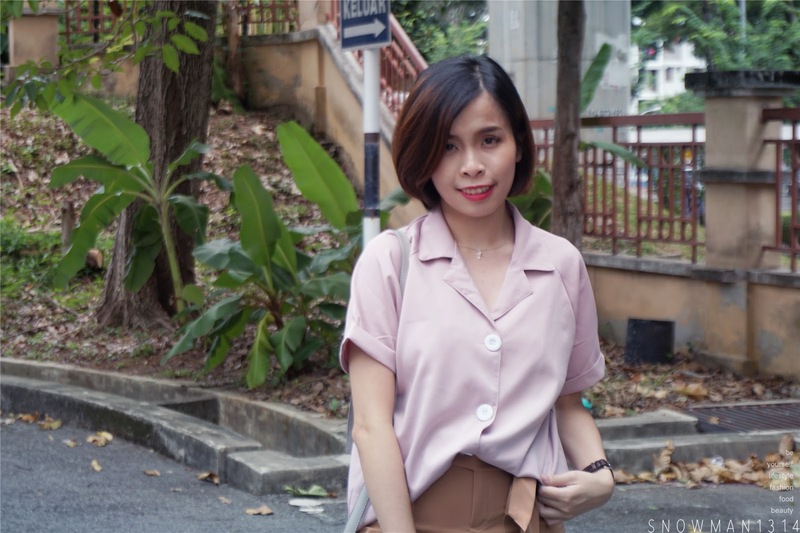 Match this look with ma gray sling bag and khakis lace flats to create this perfect neutral and sweet look with my pink top. I am not much a shorts lover but surprisingly two of my pink outfits will be shorts set outfit. Because I find myself obsessed with jeans lately especially 80's style kind of jeans with wide leg design on the bottom. Last year I was obsessed with culottes, but this year is jeans. After sharing both of the shorts looks for my weekend outfit, please prepare for a jeans versions of the weekend outfit. I even think of wearing jeans on Christmas too, I mean why not! Back to this outfit, it was a vintage Korean style outfit with big v collar and buttons. 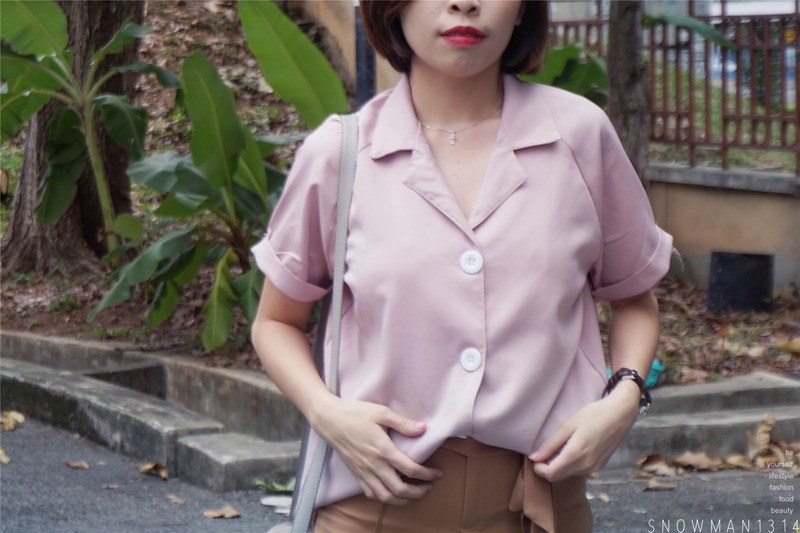 The color of the top is light blush pink and comes in white big buttons. I love the wide collar that makes the tops looks more vintage and white button to give a cuter and contrast look! My boyfriend complaining this top as auntie top too. But I do admit it was rather similar to that, but it was more on a Korean Vintage style look! Wearing my new lippy color from Bourjois Rouge Edition Sheer Matte. The whole outfit looks really plain and pale color, hence you can apply a vibrant lip color to gives more energetic and pop out your look with your vibrant lips color. Here's end my short outfit updates! Stay tuned for more. it's nice concept for pink outfit. Like your style! I like the sober color. The big collars too look good. I started to like blue coloured apparel since last year, and now add in white as well! I'm adding in blue and pink too! I like your casual outfit, looks comfy and chic. You look gorgeous in pink. Such a great mix and match choice. Thumbs up, stylish babe! Aunty or not, the top looked good on you. I don't really like khaki shades, though, Brown has just never been my favourite. vintage pink eh .. looks sweet and nice on you. I think vintage pink is kind of awesome to set the autumn mood. 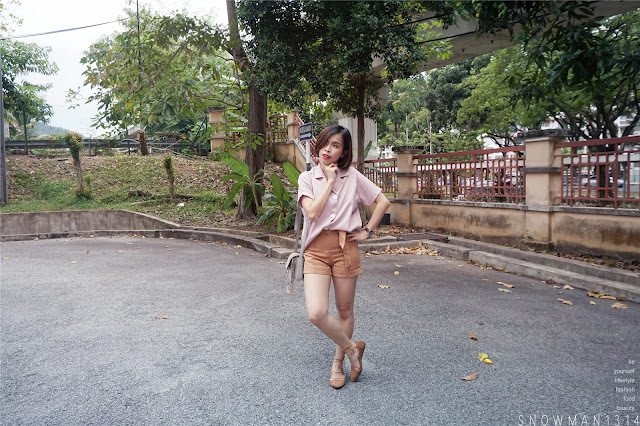 you look sweet in pink, got nice legs to show off the short pants too hehe. Hi pretty! nice outfit. Love the top. Thats a really trendy vintage look. you pulled it off really well babe! To me, pink always my favourite but something is hard to match with other outfit. Simple and comfortable looks suit me more. i think i love ur ballerina flats so much!! !